Wrinkles and other symptoms of damaged, aging skin can start showing up in your 20s and will only get worse over time, warns the American Academy of Dermatology. 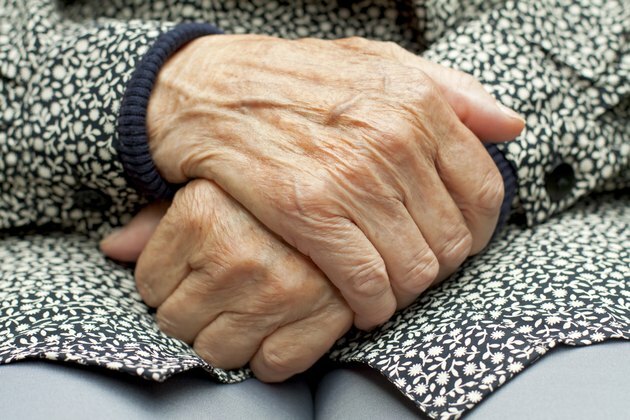 Your hands are a prime spot for such aging symptoms because they're constantly exposed to environmental damage like sun exposure or excessive washing that leads to dehydration. Thankfully, lifestyle modifications and skincare products can help rejuvenate your hands' youthful look without requiring painful or expensive treatment from a doctor. Moisturize regularly with a basic hand or body lotion. Good Housekeeping magazine reports that your hands' skin cells are made up of mostly water, and dehydration can cause any existing wrinkles to look worse. A hand lotion helps plump up your cells with moisture again to help diminish wrinkle size. Hide your hands from the sun, whose ultraviolet rays significantly damage your skin and are a major cause of aging symptoms like wrinkles, according to the American Academy of Dermatology. When you go outdoors, smooth on a sunscreen product or put on a physical barrier, such as gloves. Dab on a retinol hand cream every night. Retinol, a derivative of the antioxidant vitamin A, penetrates your skin cells to enhance cell turnover and also improves collagen levels. This makes it exceptionally good for combating wrinkles, according to the University of Maryland Medical Center. Smooth on a hand cream made with alpha hydroxy as an alternative to retinol. Good Housekeeping reports that it can help rejuvenate your cells and fight wrinkles by boosting collagen production. For the best reduction of wrinkles, skincare expert Paula Begoun says to use a hand cream which has an alpha hydroxy acid concentration level of 5 percent or more.